Norwalk's Carsyn Langhorn drives the ball to the basket against Trumbull defender Krystina Schueler in their FCIAC girls basketball matchup at Norwalk High School in Norwalk, Conn. on Monday, February 11, 2019. Hunte has gone in and out of the starting lineup, but Monday prior to the No. 1 Bears facing No. 4 Trumbull, Fuller had a feeling Hunte should be in the starting five. Handling the point-guard duties, Hunte controlled the tempo all night, driving to the hoop and distributing the ball to everyone in white as the Bears had seven different players score but none in double-digits. More importantly, Hunte and the Bears played lock-down defense, knocking off the Eagles 41-37 in front of a large, boisterous crowd in Norwalk. The win gives Norwalk (19-0, 15-0 FCIAC) the No. 1 seed in the FCIAC tournament beginning Saturday and puts them one game away from an unbeaten regular season with only a home game against Ridgefield standing in their way. Norwalk will also be the No. 1 seed in the CIAC Class LL tournament by virtue of the win. Trumbull (17-2, 14-1) lost for the first time in the FCIAC and will be the No. 2 seed in the FCIAC with a win over Trinity Catholic Wednesday night. Trumbull was paced by sophomore Allie Palmieri’s 19 points. Norwalk led by five at halftime but Trumbull’s defense got it back in the game, holding the Bears to five third-quarter points. 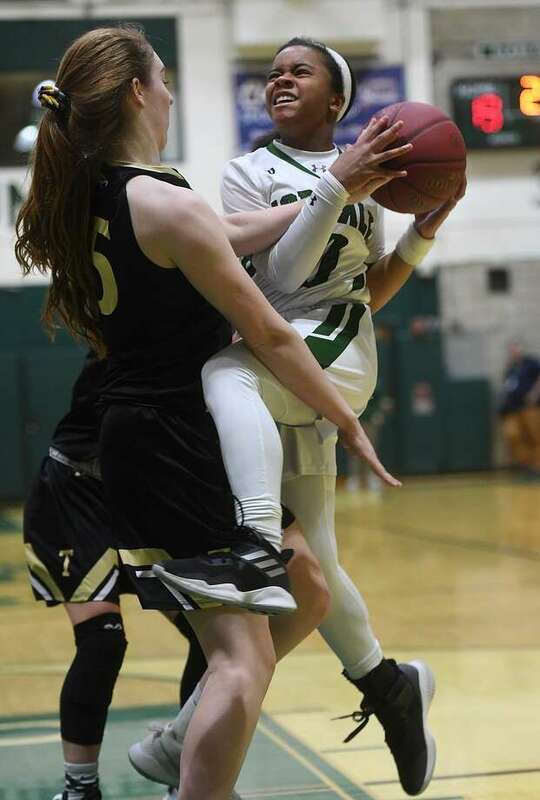 Trumbull took the lead briefly early in the fourth but a drive to the hoop by Hunte and a 3-pointer by senior Ashley Wilson put Norwalk back on top to stay. Belinda Hunte, Norwalk. Hunte led Norwalk with 9 points including hitting a free throw with under 10 seconds to play, putting the Bears up by four.